It's hard not to get excited and carried away at this time of year - I love it! 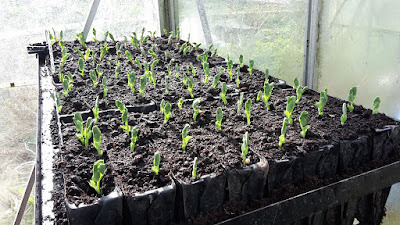 So far I've got two types to peas coming up (a mangetout and a soup pea for drying) and the broad beans were just breaking the soil today (I could have been so much earlier with the broad beans if I'd been organised!). In the greenhouse I've also started two types of beetroot, kohlrabi, red cabbage, sage, globe artichoke (coming up today), red Russian kale (for baby leaf), celeriac, coriander (cilantro for you guys on the other side of the pond) and three different lettuce, I'm planing on sowing some carrots as well and protecting a bed with some plastic to get them earlier. Who else has gone mad on sowing seeds already? I'm planning on transplanting most early crops this year to give me a bit of a head start! Also if you've got a spare 60 seconds pop over to this survey and vote for my blog please! It's for best smallholding blog, and although there's no prize it would still be nice to win! Thanks! The seeds are ready and spring is less than a week away but it is supposed to be 18F with the wind howling tonight so I can only think about starting seeds here. The main ones I start and then set out are tomato, peppers and tobacco with everything else going in the ground much later. I have my bedroom window sill with a good collection of plants on there, I'll be swapping them round soon and getting more on the heat. I have a few Mexican herbs that like a bit of heat to germinate. We quite often have a warm snap in march in recent years. I gave you my vote! No seed sowing here, if you take a look at my blog you'll see why! Thank you! That is a lot of snow, don't fancy that in march! 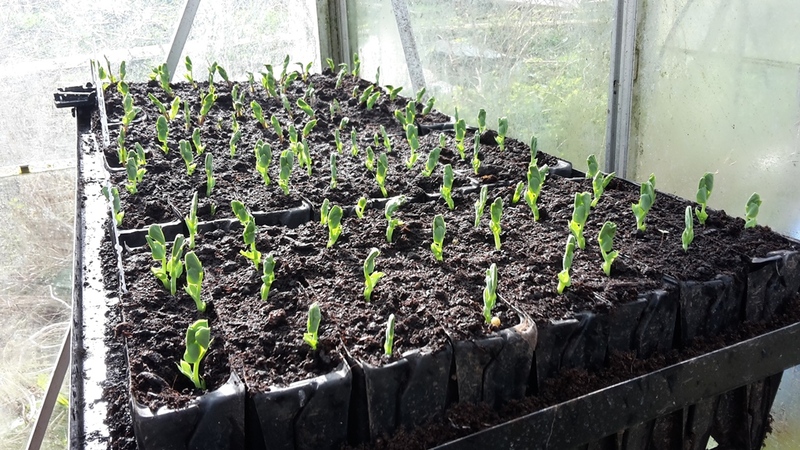 The broad beans will easily catch up now the weather is generally warmer. I always plant over wintered ones, as these give the very earliest crop, but it is very hit & miss whether they survive. I've got just one plant left from an autumn sowing - the wet relatively mild winter caused fungal diseases. But an early maturing variety sown last week, at a time when the weather really helps growth, are not far behind that one remaining plant. It's funny how things catch up, you're right. I always just kick myself for not getting some in last year, never managed it yet! My wife doesn't liek them anyway so they're only for me - posh beans on toast at lunch time! Hi Kev. I have got quite a lot of seeds started in my little Poly House; salad leaves, two types of toms, spinach, climbing peas, beetroot, cress, sunflowers, marigolds, cabbage, two types of aubergines, sweet and piquant peppers, spring onions, cucumbers and maybe something else I have forgotten. I am LOVING sowing and growing in Spring! Vote done. Sounds like you're doing better than me! I'd love a polytunnel! Maybe next year. Reminds me to order some spinach seeds as well! I tried voting, but unfortunately I am getting this message, This survey is currently closed. Please contact the author of this survey for further assistance. I have sown a few of the chili seeds, but need to discuss adice for the others. I'll message you on fb about those. Thanks once again for the sseds. I think it had closed today, thanks for trying though! Good job on getting the chillies planted! I might sow a few more yet, I have a friend who is a real chilli head so I might put in an extra hot one just for him! I got the message that it's closed as well :( I have some cold crops sown but nothing has sprouted yet. Things have just started poking up out the ground, braccisas and beets mainly. Exciting stuff! Oooh it's ridiculously exciting isn't it? I was planning on being super organised but can feel myself falling behind already! I guess flexibility has to come in to it though.